Ginger is an ancient food item and the health benefits of ginger water are known worldwide. Originally from Southeast Asia, this plant is filled with loads of minerals which promote health. While in most of the house-holds ginger is used in cooking, to get its best benefits, people should have it in raw form. Well, ginger does not taste too good when raw! Health benefits of ginger water are equivalent to that of raw ginger. Also called as ginger tea, sipping a cup of piping hot ginger water can refresh your morning/ evening. Ginger is an Ayurvedic potent. This herb is filled with numerous minerals like copper, potassium, manganese and magnesium. Some well-known ginger water benefits are mentioned below. Unhealthy lifestyle and stress often lead to obesity in recent days. Ginger water benefits for weight loss are immense. This water can be of great assistance to reduce weight along with good food, exercise and a changed lifestyle. It has been observed that after having a meal if people drink a cup of hot ginger water, they might feel full for a long time. This will reduce the craving for food, overeating and ultimately lead to weight loss. Inflammation, which is the natural process in the body to safeguard it from injuries or diseases, has gradually become a chronic health issue. Poor diet, harmful chemicals and germs within the body lead to excess inflammation. While the considerable change in diet and lifestyle is needed to fight inflammation, ginger water can be a part of the change. Ginger is known to reduce allergic reactions, which play a significant role in inflammation. Facing extreme muscle pain after long hours at the gym? Drink a cup of hot ginger water after a workout, it is known to offer some relief. A study was conducted with 60 people who frequently suffered from migraine pain. According to the research results, ginger water acted as an add- on therapy to reduce the pain; this natural ingredient was recommended over painkillers. Ginger is also a rich source of antioxidants. This means it boosts the anti-aging agents in the body. It fights the free radicals (Reactive Oxygen Species) which lead to stress and cell damage. Drinking excess alcohol, excess smoking and chronic stress enhances the ageing process. Besides reducing these negative drinking habits, a cup of ginger water every day may mean a glowing, young face for years! The next good news is, ginger is the source of Vitamin A and C. These are known to improve the texture of hair. The antibacterial properties of ginger cleanse the blood, which in turn prevents acne and skin diseases. Antioxidants in ginger strengthen the heart. It also might reduce arginase activity, LDL (also called bad cholesterol) and triglycerides. It can also safeguard the body from kidney diseases and tumour growth. People suffering from neurodegenerative diseases like Parkinson’s disease, Alzheimer’s disease and Huntington’s may also get some relief by drinking a cup of ginger water every day. Last but not least; ginger water is known to have a positive effect on cancer patients. This is because according to a study, ginger gas the capability to slow down the growth of a tumour. 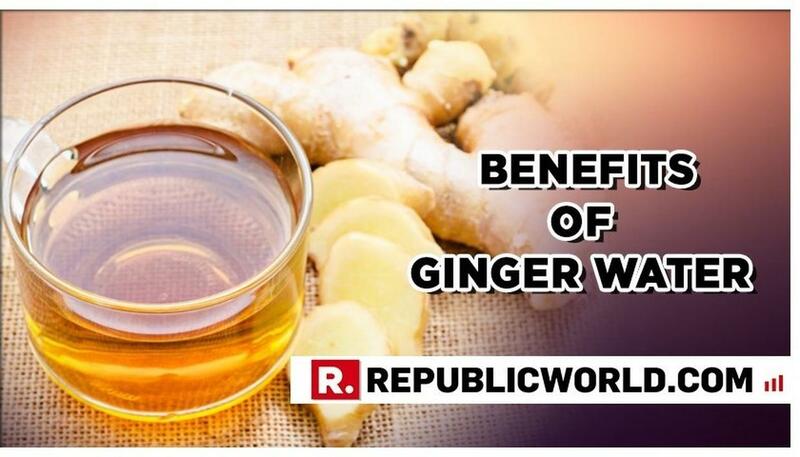 This is another health benefit of ginger water. Either you are feeling low, suffering from nausea, indigestion or vomiting on a regular basis, regular consumption of ginger water can be of help. Even pregnant women can get relief from nausea and vomiting issues with this drink. As per a 2015 research study, people who drank ginger water on a regular basis got some relief from postoperative nausea, side effects of chemotherapy, nausea caused by viral diseases and morning sickness. Releasing toxins regularly from the body is important to stay fit and energetic. Having ginger water regularly (maybe at the start of each morning) keeps the body hydrated. Some suggest ginger water with lemon juice to enhance its effectiveness in the process of detoxification. Ginger can help lower blood sugar levels. So, people suffering from chronic diabetes can have ginger water to control blood sugar levels. People with type 2 diabetes can get some help with ginger water but they should always consult a doctor before making any change in the eating/ drinking habits. In a 12 week study, it was found that 2 grams of ginger powder were more effective than placebo drug in controlling the blood sugar levels. How to make ginger water? Let us now understand the process of making ginger water at home. • You will need the ginger root and water to prepare the drink. • If you want a strong drink give less water and more of ginger and vice versa. • Grate the ginger with a zester. • Add the grated ginger to the boiled water. • Keep the solution as it is for 10 minutes; this lets the ginger seep the water. • Strain the ginger pieces from the water. • Drink the ginger water either hot or cold. • You can add honey to the drink to add some taste. • Ginger water can be made in a large amount and refrigerated for longer use. • Always make ginger water with fresh ginger. • Wash the ginger root which will be used to make the drink. • Do not peel the skin as most of the nutrients are just beneath the skin. • People should not have more than 4 grams of ginger in a day. Excess ginger might lead to thinning of the blood. • Doctors do not recommend ginger for children under the age of 2. • Cardiac and diabetic patients should consult a doctor before including ginger water in the diet. Benefits of ginger water are here to stay for more than hundreds of years – more so because it is an organic medicine and not just a plant root. Please consult your Physician before proceeding with any diet.